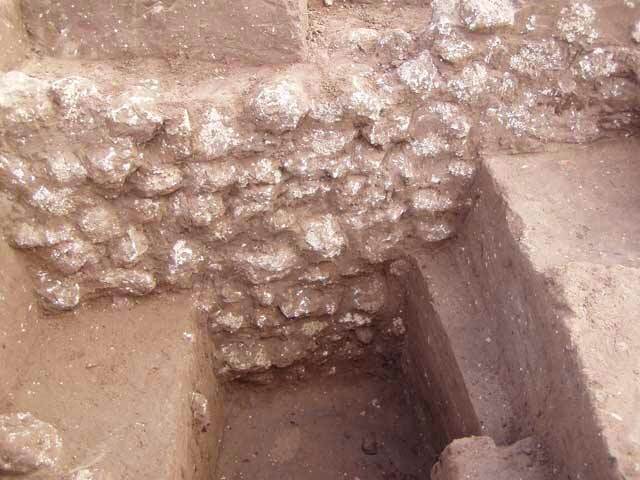 During February 2005, a salvage excavation was conducted at 23 Ha-Tayyasim Street in Ashqelon (Permit No. A-4382; map ref. NIG 15875–90/62120–32; OIG 10875–90/12120–32). 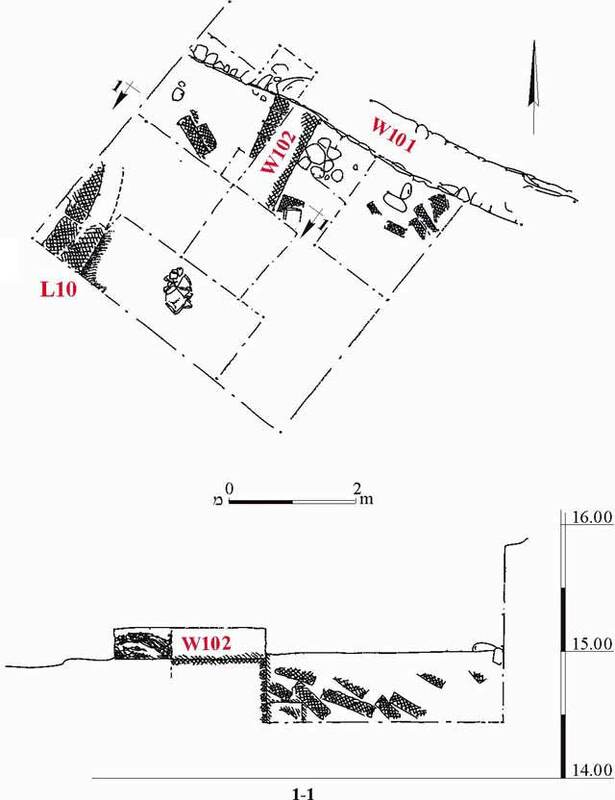 The excavation, undertaken on behalf of the Israel Antiquities Authority and underwritten by G. Makhlouf, was directed by Y. Haimi, with the assistance of V. Essman and V. Pirsky (surveying) and C. Hersch (drawing). 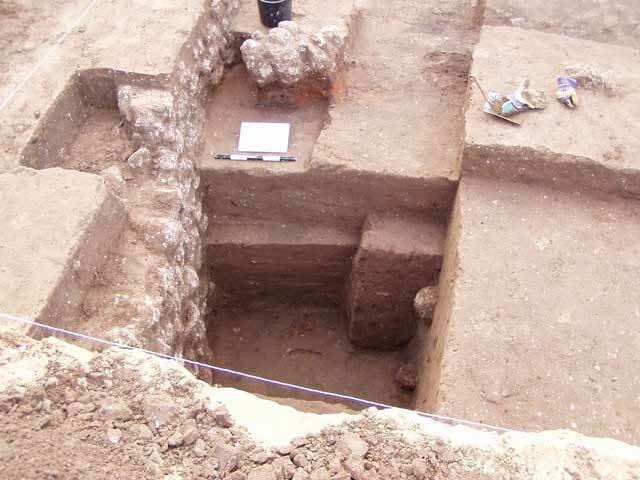 Following the removal of sand and the exposure of the area, one square was opened, in which part of a building that dated to the Early Bronze Age was discovered (Fig. 1). A wall built of fieldstones and wadi pebbles and oriented east-southeast–west-northwest (W101; length 6.4 m, width 0.6 m, height 2.4 m; Fig. 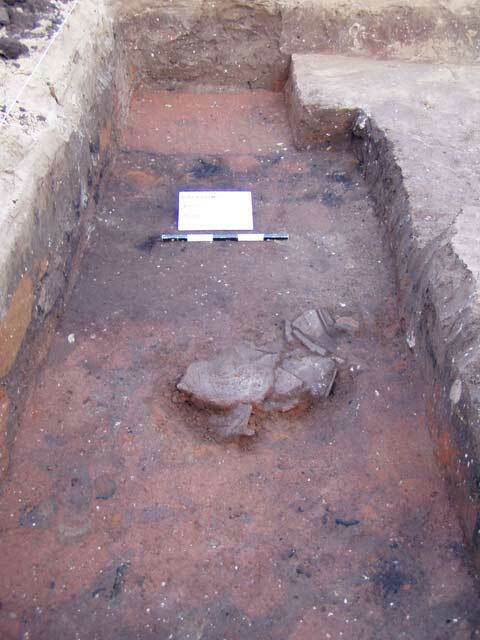 2) was exposed in the northern part of the square; the wall continued eastward beyond the limits of the excavation area. Another wall built of mud bricks (W102; length 1.8, width 0.7, height 1.58 m; Figs. 3, 4) abutted W101 from the south-southwest at a right angle. An elliptical installation built of mud bricks (L10; 0.7 × 1.8 m; Fig. 5) was exposed in the southwestern corner of the square. The orange color of the mud bricks indicates that they were fired. The slipped fragments of pottery vessels in the excavation were characteristic of Early Bronze I and included kraters (Fig. 6:1, 2), a jar (Fig. 6:3), a jug (Fig. 6:4) and a ledge handle (Fig. 6:5). 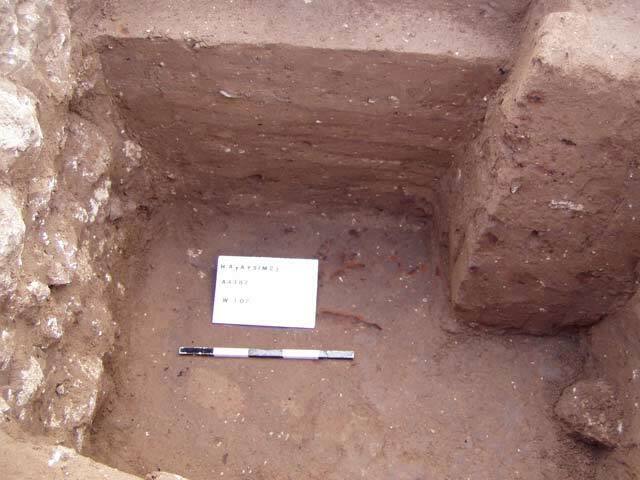 The orientation of the two walls suggests a connection between them and the remains of a building from the same period that had been discovered in the past c. 10 m northeast of the excavation, prior to the construction of the house at 21 Ha-Tayyasim Street (Fig. 7; HA-ESI 118). 2. Wall 101, looking northeast. 3. Wall 102, looking southeast. 4. Walls 101 and 102, looking southeast. 5. Installation (L10), looking northwest. 7. 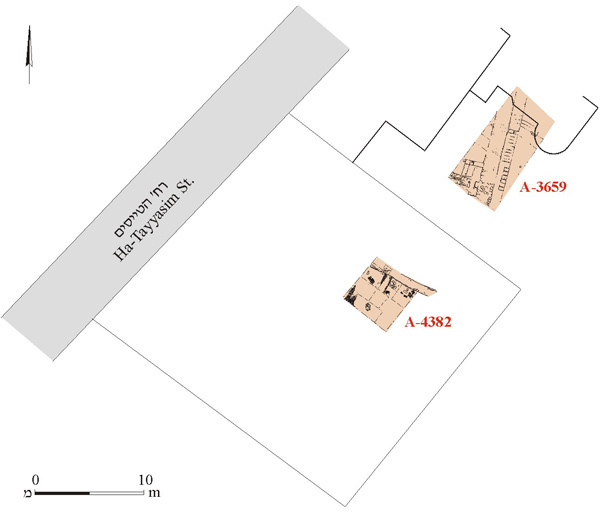 The excavations at 21 and 23 Ha-Tayyasim Street, schematic plan.